When you're getting ready to hit the pool with your not-yet-potty-trained little one, finding that you forgot to pack the swim diapers creates a dilemma. You might consider putting on a regular diaper and hoping for the best. But pools insist on swim diapers for both safety and sanitary reasons. It might seem strange to count the ability to repel urine as a plus for a diaper. But for swim diapers, non-absorbency is a positive factor in the pool. Regular disposable diapers soak up water like a sponge. That's one of their major selling points. But when you put your child into a large body of water, you don't want a thirsty sponge around his lower region soaking up so much water that it weighs him down. That's why manufacturers make swim diapers with water-resistant materials to absorb less liquid. Wearing regular disposable diapers in the pool could increase your child's drowning risk if it pulls him down in the water. A diaper only does its job if it stays on your child's bottom -- and stays in one piece. Since a regular disposable diaper absorbs fluid, it's more likely to reach its water-holding limits quickly. At that point, it will anchor your child in place, since it weighs more than he does, fall apart completely, or fall off and slide to the bottom of the pool, where it can't serve its basic purpose -- to keep urine and stool confined. If you're thinking about putting a regular cloth diaper on your child to avoid this, think again. Cloth diapers also soak up water and become heavy. Plus, they droop and sag -- so leaking is inevitable. While chlorine neutralizes anything nasty in urine -- which is usually sterile anyway -- having feces in the pool water reaches a whole other grossness level. Both regular disposable diapers and swim diapers keep feces within the diaper, as long as the pieces of stool are fairly large and the regular diaper isn't so saturated that it falls off. But since a regular disposable diaper will reach its saturation point fairly quickly, it's more likely to fall off or fall apart and leave pieces of stool floating in the water as the diaper sinks to the bottom of the pool. Because regular disposable diapers retain fluid better than swim diapers, they're less likely to leak if your child has diarrhea. However, if your child has diarrhea, he shouldn't go in a pool wearing either a regular or a swim diaper. Neither regular diapers nor swim diapers do a good job when it comes to retaining microorganisms in stool that can cause illness. 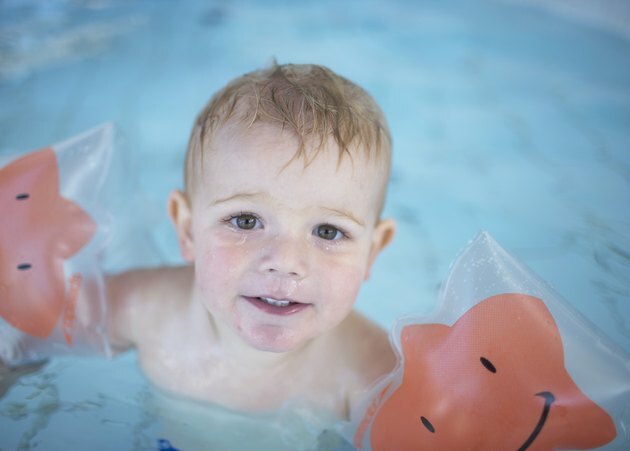 A study published in December 2011 in the "Journal of Water and Health" found that swim diapers didn't retain particles similar in size to cryptosporidium, a chlorine-resistant protozoan parasite and frequent cause of waterborne disease outbreaks. The swim diapers tested released between 50 to 97 percent of the particles within 1 to 5 minutes. What Is Sodium Polyacrylate & How Is it Used? How to Tell If Your One Year Old Has the Stomach Flu?